Lots of brood in Hive A. 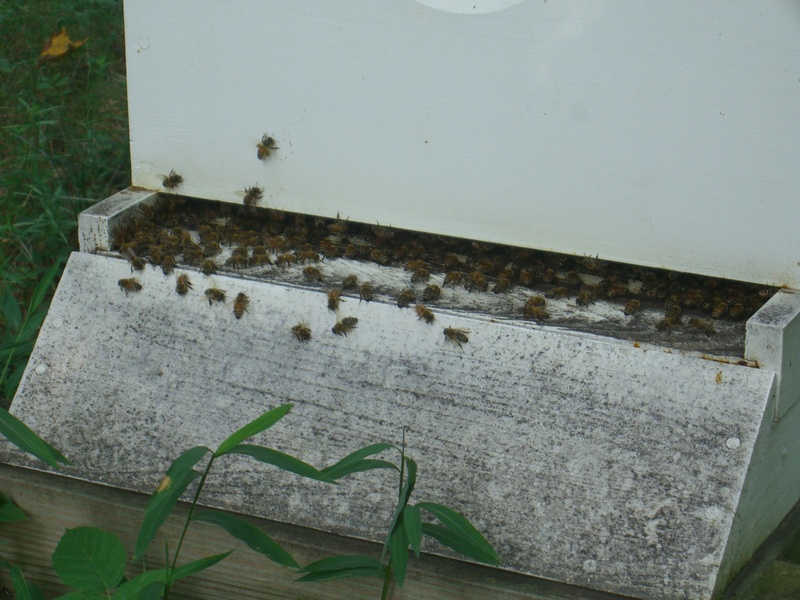 The good news from the bee yard is that Hive A is strong and healthy. No honey from them, but we did not really expect any this first year. 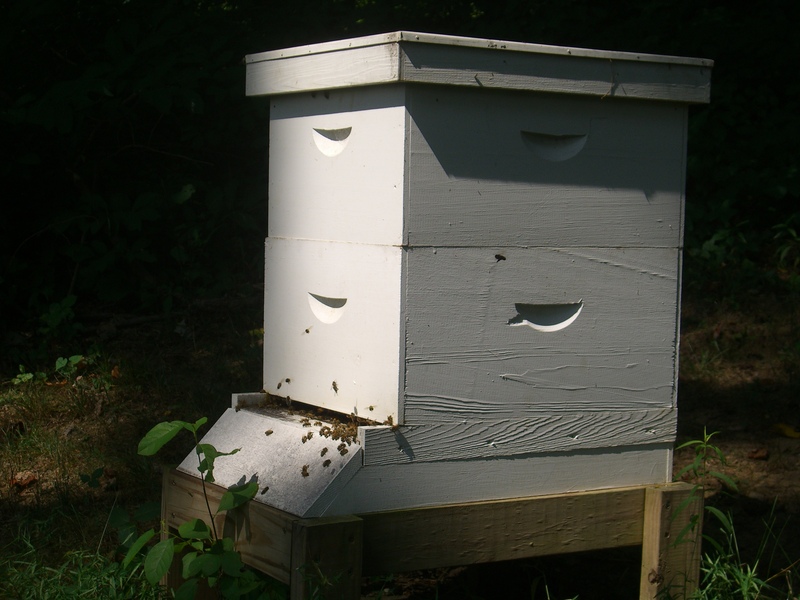 Hive D, the provider of our July harvest, has several frames of capped honey in the second honey box. Mr. Beekeeper decided to leave the honey box on a bit longer because the goldenrod is still blooming and (the real reason), because he did not bring the fume board with him to enable us to take the honey. So there’s some fun to look forward to…a little fall harvest. To those of you who are weeping desperate little tears hoping for honey, I’ll let you know what we have when we get it all into jars. A peek at the fall harvest. 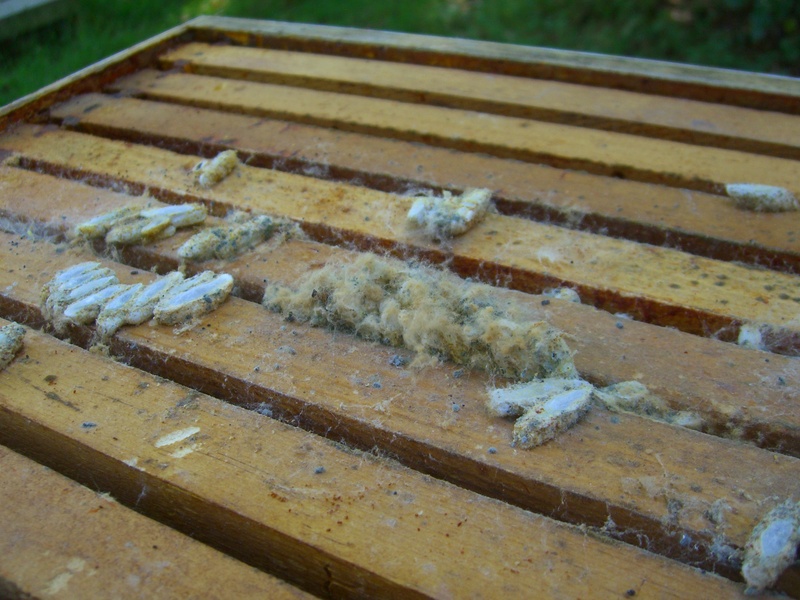 Small hive beetles can ruin a hive and its harvest by breeding in the bee’s brood cells. Small hive beetles were seen in Hive B. This is not ok. There are a variety of ways to eliminate them, each with their own advantages and disadvantages. On the chemical side, Checkmite+ is a varroa mite control that will also deal with beetles. It is authorized for use in Maryland. However, Mr. Beekeeper already bought Apistan for fall application against varroa this season, so we won’t be buying Checkmite+. It also is a heavy duty chemical attack and the beetles do not seem to be that prolific. There are non-chemical options for physically trapping the beetles. 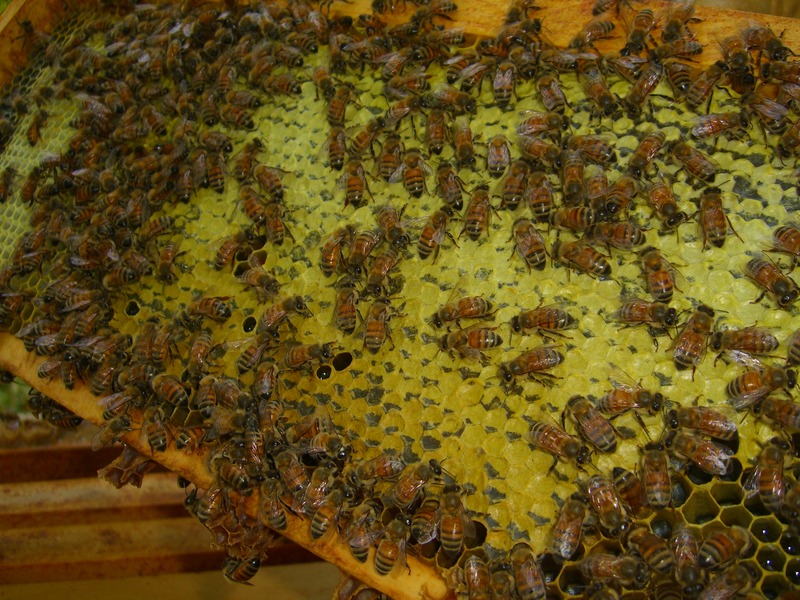 Traps vary in design and placement in the hive. What they have in common is a physical trap for the beetles to fall into and something for them to drown in, like mineral oil, vegetable oil, or vinegar. One calls for a mixture of water, apple cider vinegar, sugar, and ripe banana peel. That sounds like too much work. I’m looking at getting a type that hangs between the frames, with a simple oil bath to drown them. 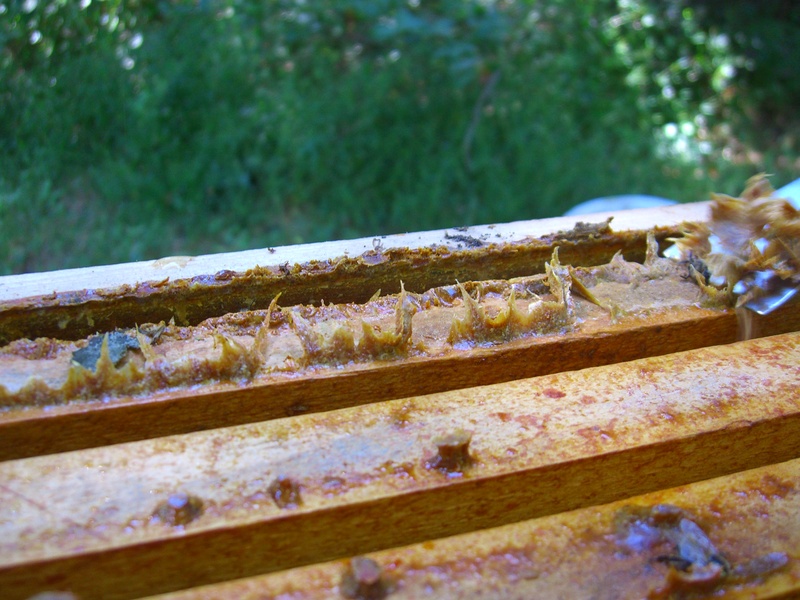 I am fully aware that the bees may seal the thing with propolis, because they like to seal things with propolis. But these traps are cheap and disposable. 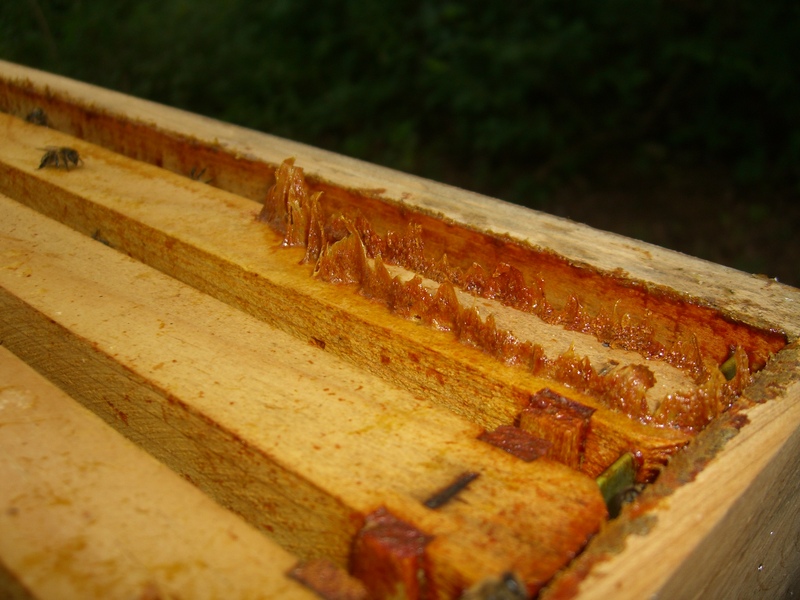 Propolis is the sticky stuff bees make to seal the hive. It’s a real pain to get off countertops. The hive is dead and full of wax moths. They can do serious damage to the hive structure. Hive C is, alas and indeed, dead. And completely ruined by wax moths. Mr. Beekeeper stopped up the entrance to prevent stray bees from going in and, more importantly, moths from coming out. There were many cocoons in the hive. He will be removing the hive and putting the frames (wrapped in plastic bags) in the freezer to kill off the moths before cleaning the frames and storing them in plastic for the winter. What killed off Hive C? Was it the wax moths? Or was it a weak queen? This is a hive that survived last winter but has been (along with Hive B which has the beetles) slow to build all season. Did the queen die and the hive fail to produce its own queen? Did the moths get established in a weak hive or did they seize the opportunity to take over a dead one? A puddle in the hive, most likely from condensation. Hive D continues to thrive but opening the lid revealed a puddle of water, presumably from condensation from inside the hive. 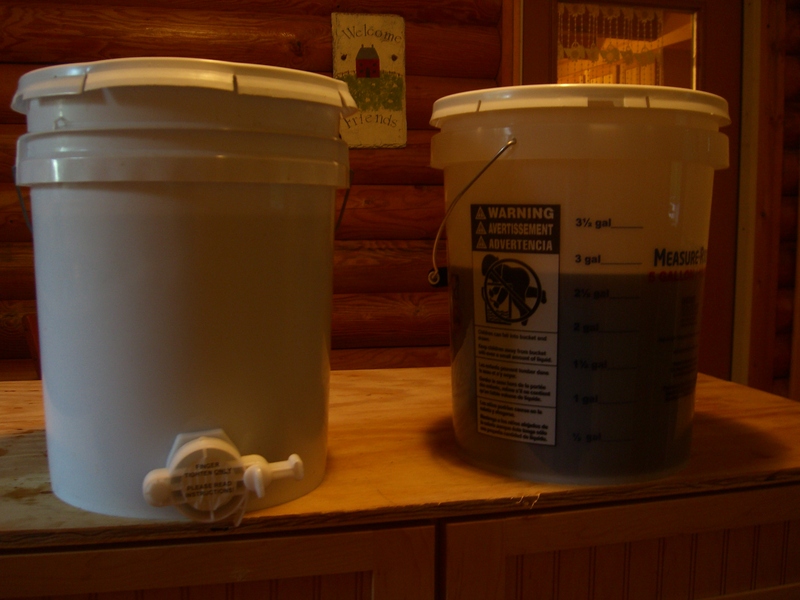 Some online searching offered many solutions for winterizing the hives to avoid condensation, but it is not winter yet. I do not have any ideas at the moment, but do know that condensation in the winter freezes, and cold, wet bees die. (Beekeepers, your suggestions are most welcome!) 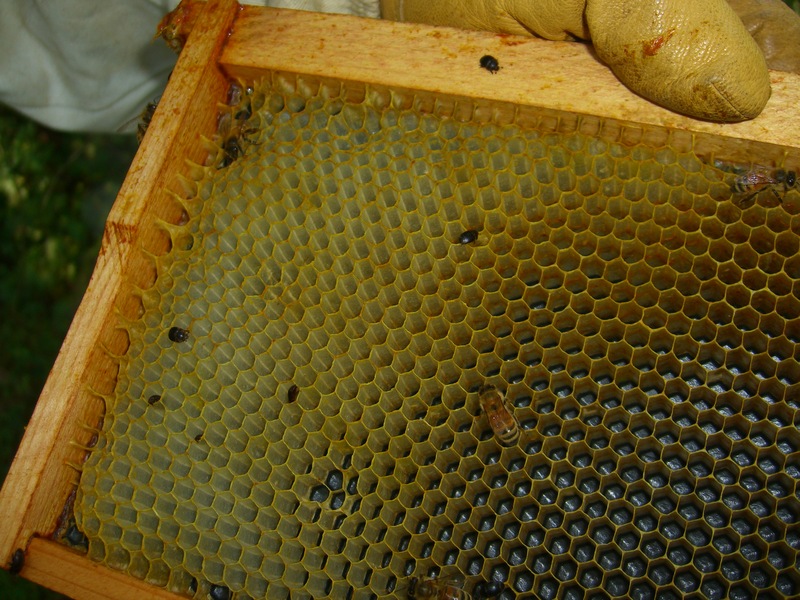 Aside from water on the lid, the bees were busy in the honey box and several frames have capped honey for us! So many questions. Here’s one I know some of you are thinking: What else does she have in her freezer? And oh, the tales we could tell. But that’s another post! Group work. What are they doing? Probably guessing what I’ve got in my freezer. 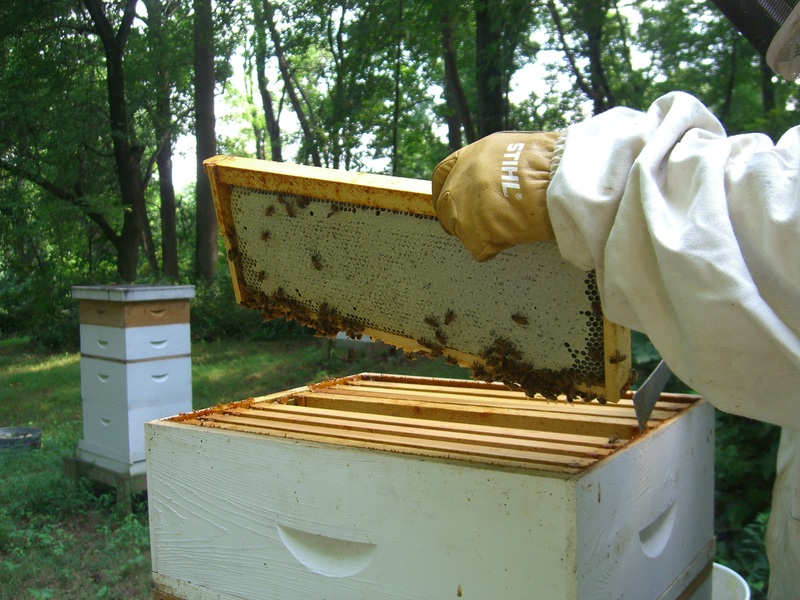 It’s the big question everyone has when we harvest a honey box. How much honey is in there? Colleagues ask, “Will you have any to sell this year? 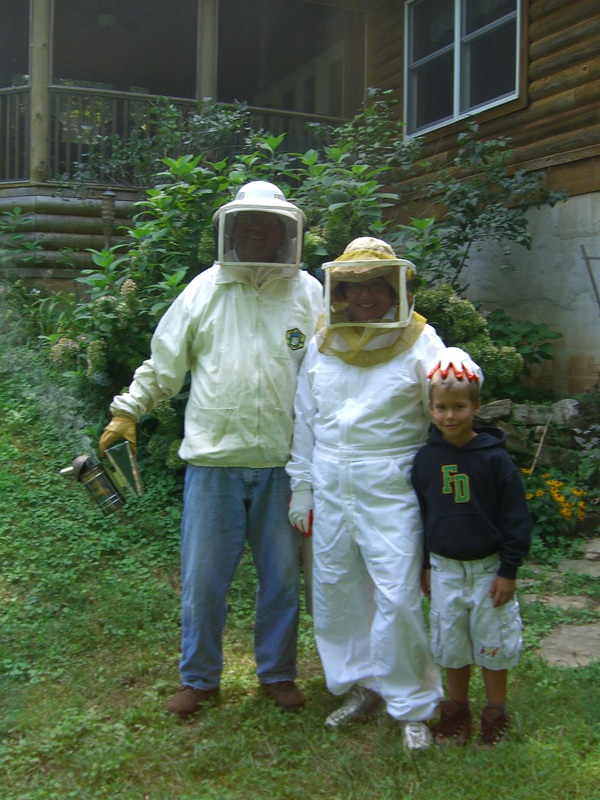 One day this week found Mr. Beekeeper and Junior Beekeeper at home together. With the Star Beekeepers aligned, it was surely the day to harvest honey. 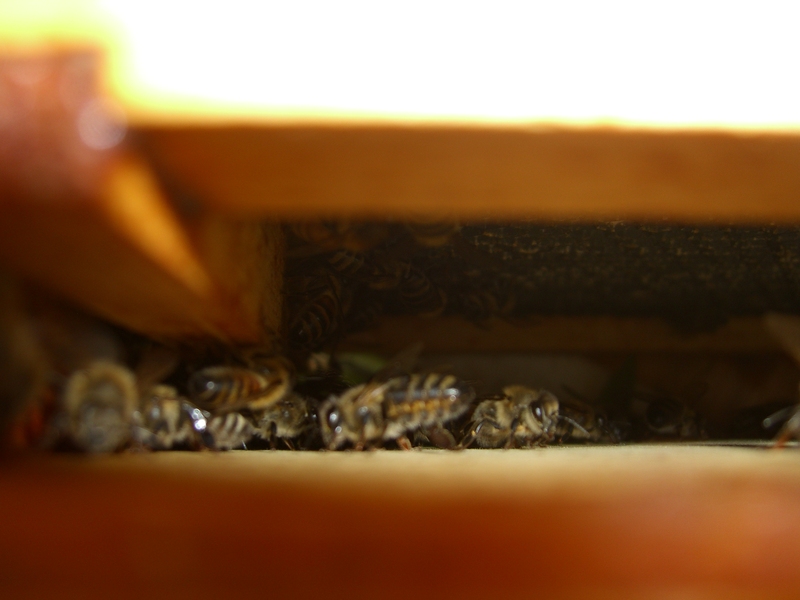 A peek through the queen excluder at the bees. Hive D. We took the lower brown box and kept the top box on for a potential fall harvest. Only one honey box was harvested this time. Hive D had clearly finished filling one honey box but was still working on their second one. We leave that to them to continue to fill. Hive A, new this year and thriving, already filling two hive body boxes, received a honey box just a couple of weeks ago. We leave them to their work. Hives B and C, who had come through winter with one hive box, have struggled to fill a second hive box. They currently have no honey boxes on them at all. Hive C had a honey box, but it was removed and given to Hive A. So we harvested one honey box. In the fall we will see if we can harvest some more. This was Junior Beekeeper’s first experience with spinning honey. 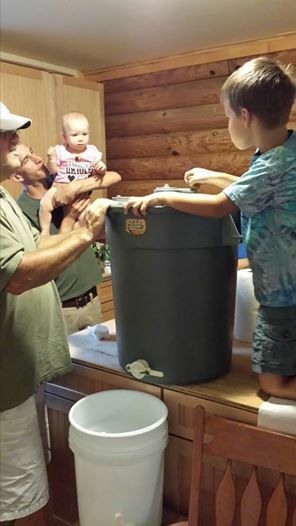 Grandma Beekeeper has been working her arms lifting grandbabies and willingly handed the privilege of honey spinning to the Oldest Grandchild. And sure enough, that’s exactly what happened to a lone bee who got processed with the honey. He got spun and dripped out onto the filter. 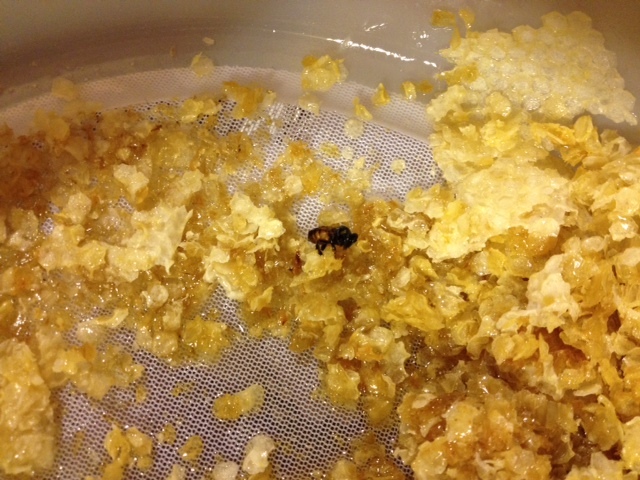 Another lone bee got stuck in the cappings which were also placed on the filter to drain. He was still barely moving the next day when it was time to process the wax. Alas, he went down the drain on a “water ride.” Some people think raw honey should not be filtered, but I personally prefer my honey without dead bees in it. So, how much honey is in a honey box? Time for some math. 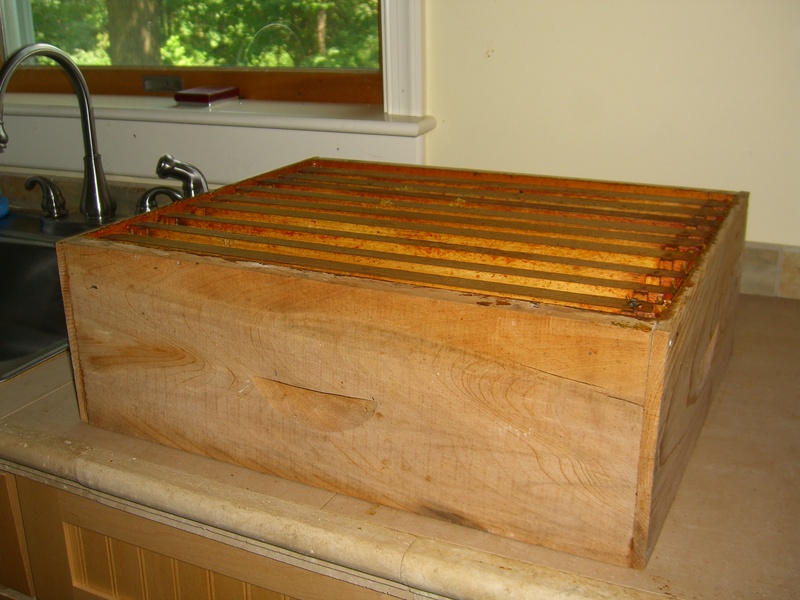 There are 9 frames in each honey box. 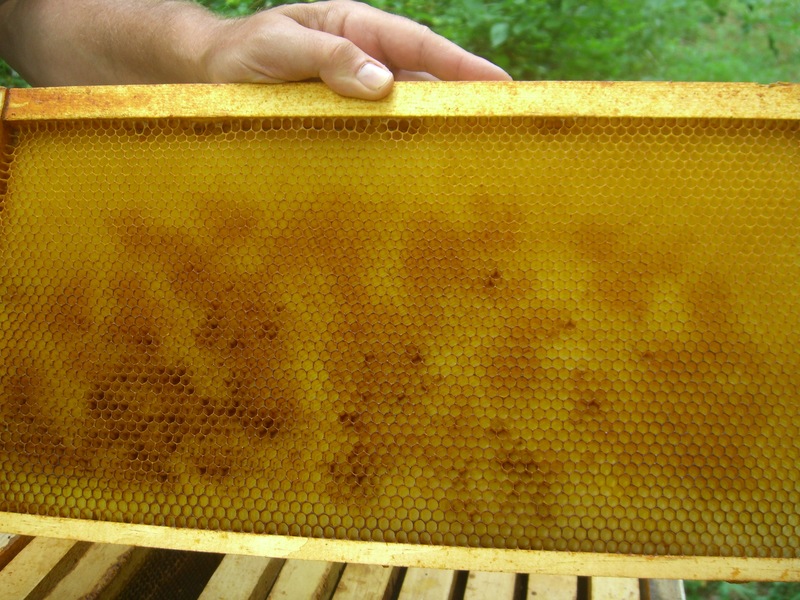 Each side of each frame contains about 80 x 30 honey comb cells. That’s 2400 little cells per side…or 4800 per frame times 9 frames. That comes to 43,000 little cells filled by busy bees. One pound of honey equals 1 1/4 cups. We have about 48 cups. So maybe we’ll get 38 one pound jars of honey. 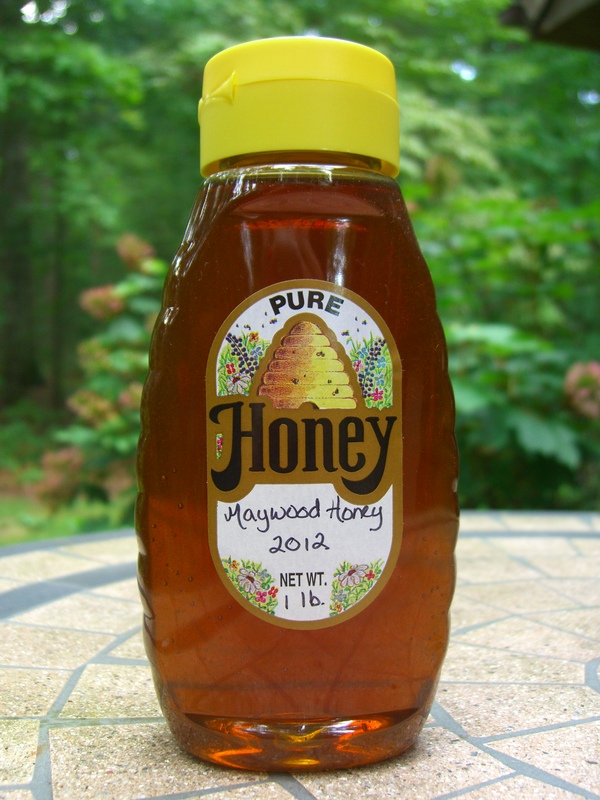 Maywood Honey 2014: a delicate fruity blend of black locust, wild grape, and wildflowers. Which means Christmas gifts of honey will be liquid gold and jars for sale will have to wait until we see what we get in the fall. Or if one of the weak hives fails to make it, then we get all their honey. But who wants a hive to fail? This is the winter that will not die. Some people are tired of the cold. It’s March–when the bees are supposed to emerge to pollinate budding red maples– and the weather forecast is still calling for a temperature of ZERO. Me? I’m sick of the hot, dry indoor air. It is so dry around here that salt is actually pouring out of the salt shakers. When does that ever happen? We usually have the salt shaker half filled with rice to soak up the moisture in the air. This morning I came close to ruining my egg; the salt came out so fast. She wasn’t swishing her hair. It was sticking straight out after an encounter with the sofa. Fortunately I have a bathroom full of products to help me look a little more like a grown-up: volumizing shampoo, moisturizing conditioners, ultra poufy mousse, anchor-it in-place sprays, and shiny stuff to give the illusion of sunlight reflecting off it. It all sort of works. 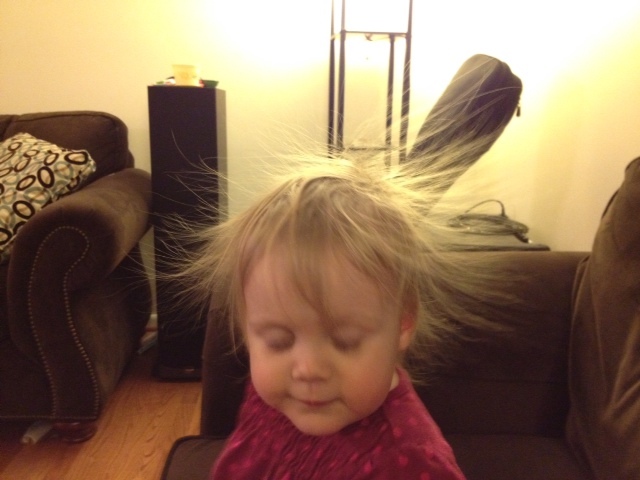 My hair isn’t quite as bad as sweet little Emily’s, but it is craving humidity. And so is my skin. Ack! Every night I go to bed with my feet slathered in moisturizer and tucked into socks. My hands, too, are lotioned and gloved. I look like Minnie Mouse without the ears. And still my skin is like sandpaper. My lip balm recipe (in larger containers!) works great on my hands and feet, but is not too practical for full-body application. My whole body really needs a milk bath. Lactic acid, ladies. It sloughs off that dry skin and leaves the rest nice and soft. This the winter where the least little thing will set off an episode of eczema. I touched chalk the other day. I was reckless, I know. I did not use my special chalk holder. It was in my desk because I hardly use chalk anymore. I just wanted to tally points for a competitive activity in class. A few measly little slash marks on the board. Ka-bam. Circle of eczema on my hand. I was moaning about this with my hairdresser who moaned back that she has gotten eczema on her neck this winter. She’s dumbfounded. Her neck? A friend of mine gets it on her eyelids. Yes, ouch. My eyelid suffering friend has found the bees to be part of her skin care routine. She uses honey to help soothe and heal her eczema flare-ups. 3-4 capsules of Vitamin E.
A bad case of eczema will still require medicine from the dermatologist, but Lisa finds she gets the best results when she uses both the medicine and the honey mask together. After a few days, the eczema improves rapidly. Then she just uses the honey when she has a flare-up. He deserves some pumpkin bread and honey butter. And maybe even a backrub. There’s a break in the weather. 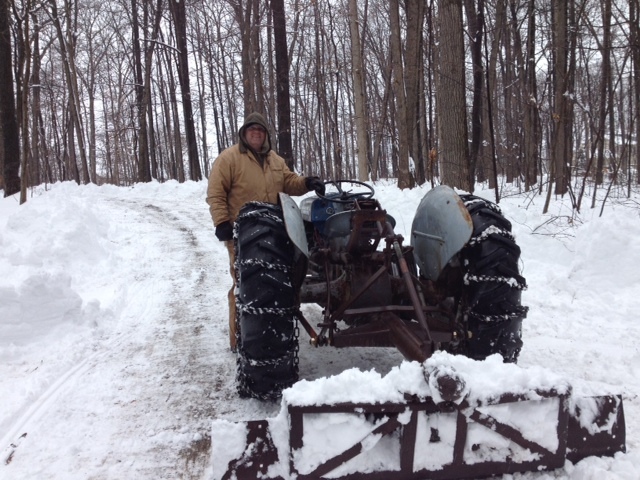 After a foot and a half of snow, Mr. Beekeeper trudges out to the tractor to plow before the next batch of snow comes in this evening. The “break” means that it is merely raining. “Merely raining” means that the foot and a half of snow is getting packed down. He will be out on the tractor for hours. And then it will snow some more. It might be nice to do some cooking for him. I’m thinking pumpkin bread with his homegrown pumpkin and some honey butter using our Maywood honey. But first, a trip to the bee yard. One of the advantages of cleaning out a closet is finding things. Often it is useless stuff the girls left behind when they moved out, but today I have found snow pants. And they fit! So, even though it is lightly raining, I don snowpants and boots for a trek through the snow. I can’t access the yard from the driveway because John has plowed a wall of snow there (which I will back into with the car until it melts), so I exit the house from the screen porch and wade through knee deep snow to get to the bees. I’m feeling bad for all the hard work John is doing plowing, but it is no easy hike to the bees today. I have marked my walking stick in six inch increments. 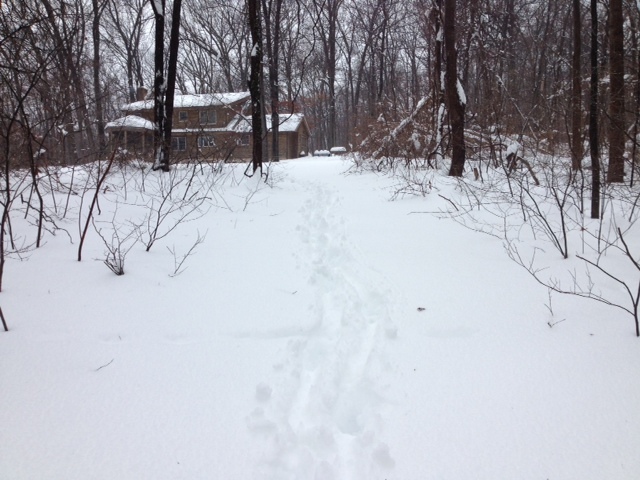 Even packed down with rain, the snow still measures 18 inches with every step I take. 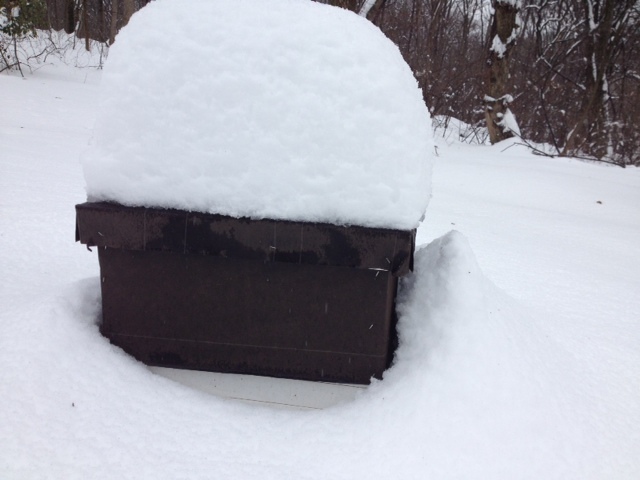 Down at the bees, the hives are putting off enough heat to keep a slim gap between the snow and the hive. 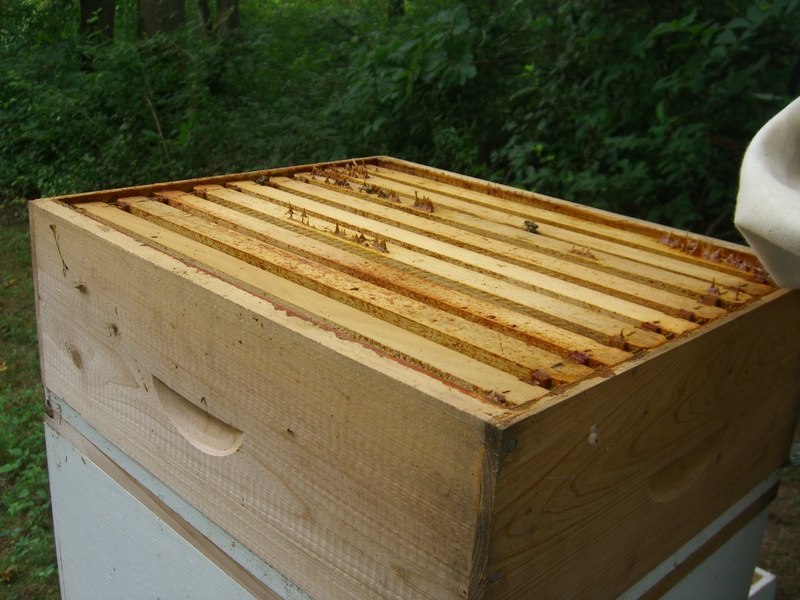 I only look at Hives B, C, and D. Beekeeper Man determined recently that Hive A is kaput. Probable diagnosis: dysentery. (My last bee post commented on signs of dysentery on the hive. With all the cold weather preventing more frequent cleansing flights, they succumbed.) However, three hives are still hanging in there. 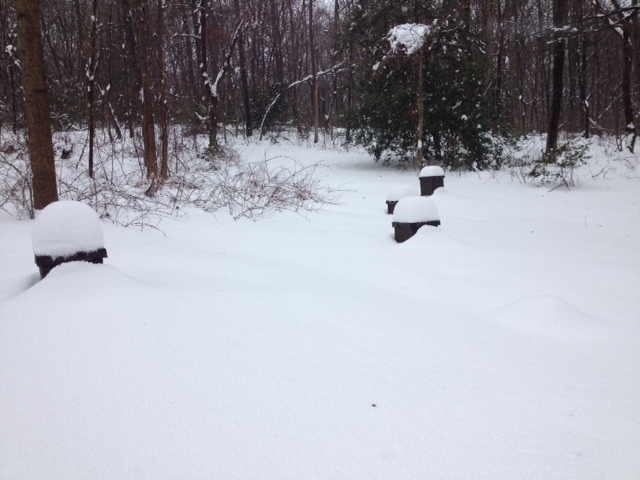 Trudging back up to the house, I am tempted to swoosh snow from the garden bench and take a breather. In the drizzling rain. Visiting the bees seemed like a good idea when I was heading down to the bees. 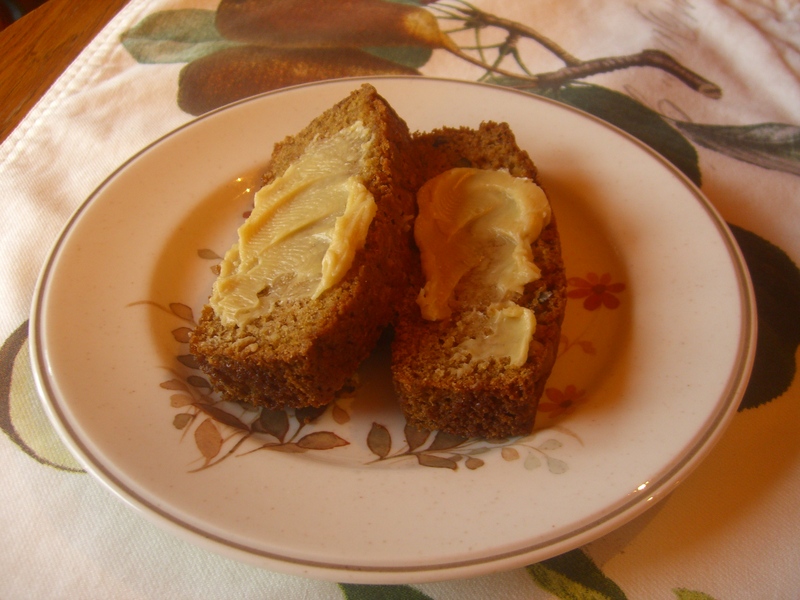 Well, I’ve gotten my heart rate up and had a little workout, so even if I haven’t worked as hard as John, I won’t feel guilty having some pumpkin bread with honey butter. It was easier walking down to the bees, than coming back up! I blended the two with my immersion blender. This is because I couldn’t find 2 matching beaters for the hand mixer, but the immersion blender worked better anyway. So creamy! The honey we have on hand right now (from the hives we lost last year) is really dark and loaded with pollen. John spun it from the brood frames after losing the bees. Put all dry ingredients into large bowl and mix together with spoon. Add all wet ingredients and the nuts. Mix until combined. Pour into 3 greased bread pans. Bake at 350 degrees for an hour. Test with toothpick for doneness. My loaves took an extra 10 minutes or so. If there’s anything more satisfying to a beekeeper than seeing buckets of harvested honey, it is seeing that golden sweetness in jars. It’s a little bit arrogant on our part to take pride in a good harvest since the bees make the honey, but there’s enough work on the part of the beekeeper to justify it. 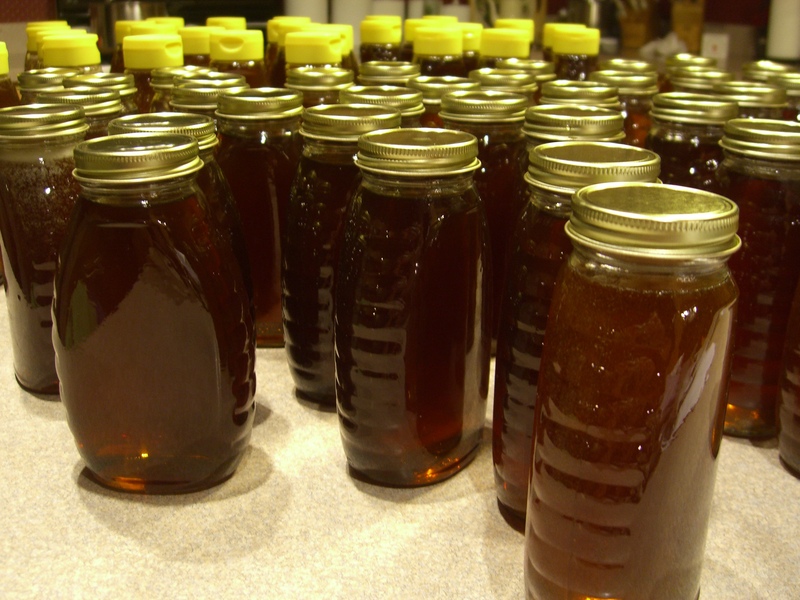 Thousands of cranks of the honey-spinner and sixty-seven jars of honey later, we can rightly call it our harvest. And it’s a yummy one too. 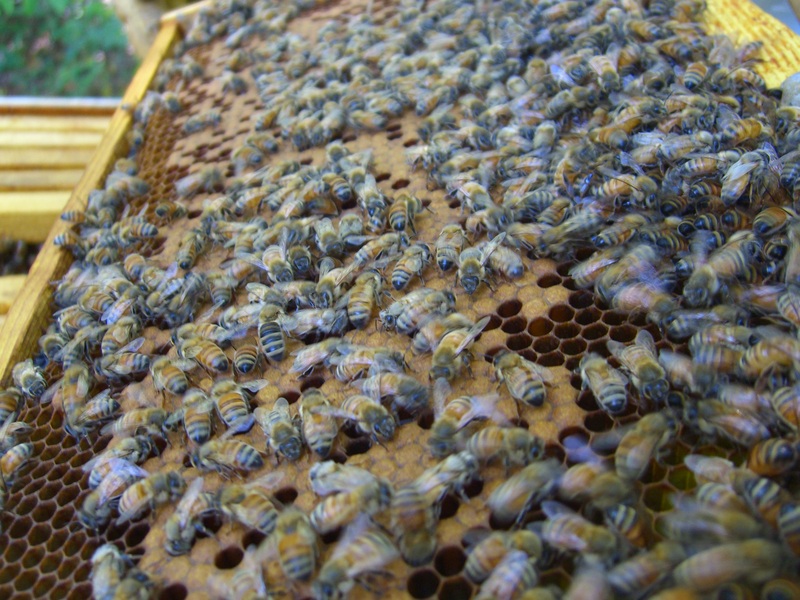 Last weekend, we spent a calm morning in the bee yard. Our goal was three-fold. First, to collect four honey boxes. Second, to do so without making the bees really angry at us. And third, to get the honey back to the house without bringing along a horde of buzzing companions. That third goal was not insignificant! John’s pre-harvest preparations were overall pretty helpful. The bee escapes that he put on the hives significantly reduced the number of bees in the honey boxes of Hives A and B. Hive C still had a honey box full of bees. John wonders if perhaps the bee escape got blocked with burr comb. And Hive D’s honey box was empty but they had not been doing anything up there anyway. To clear out the honey box on Hive C and to clear away the cloud of Hive A bees who were looking for a fight, John used the fume board. 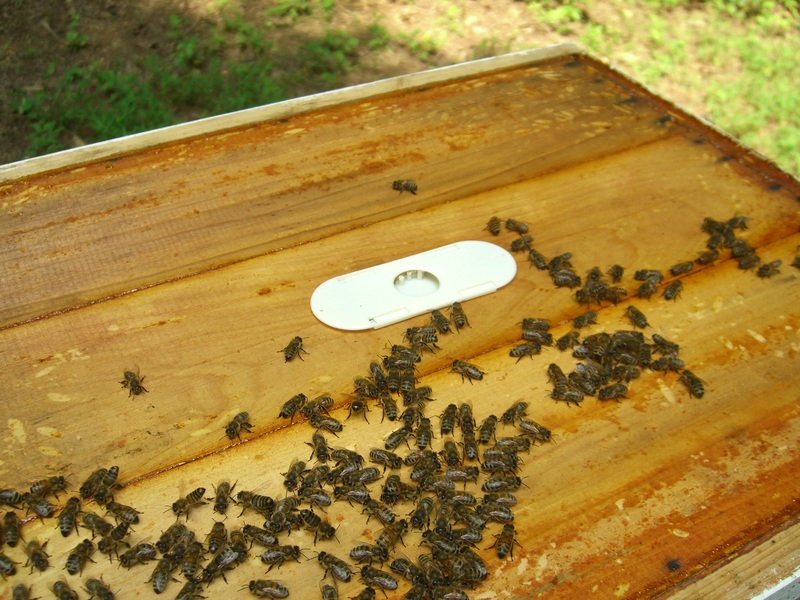 The fume board is a hive lid that you squirt with a nasty smelling liquid. The bees can’t stand the smell and dive deep into the hive. Humans aren’t too crazy about the smell either, which explains why the bottle was shipped in a bazillion layers of plastic wrap. 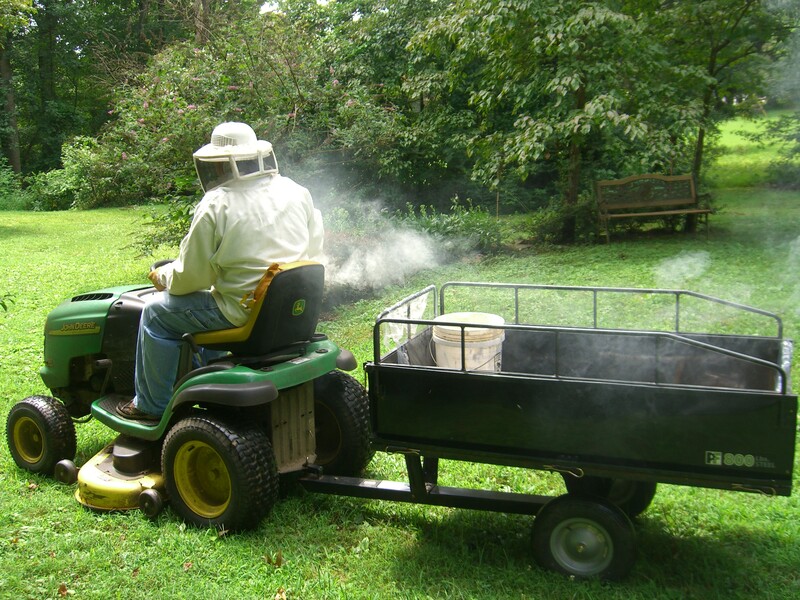 After a few minutes of fume board, the honey box is nicely empty of bees and John can easily remove the honey boxes and load them onto the tractor cart for transport to the house. The fume boards get stored in the cabin where we don’t have to smell them. 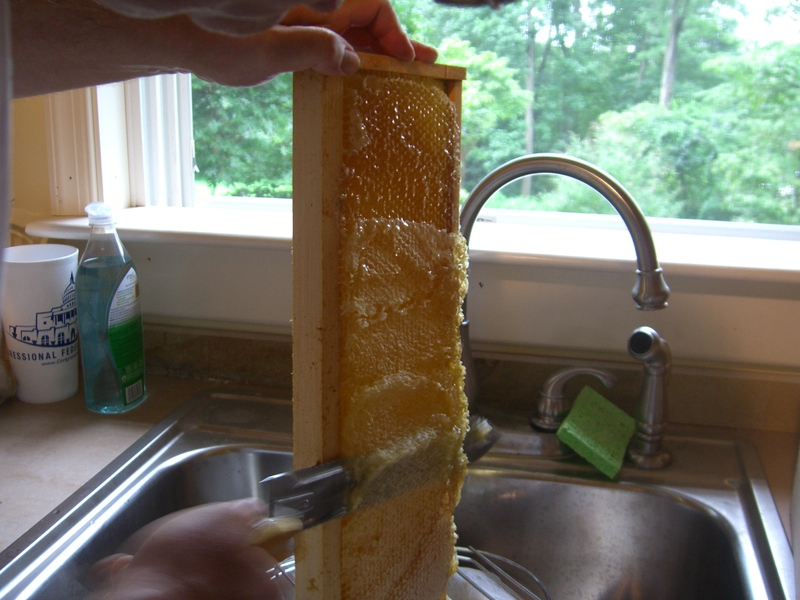 At the sink, John cuts the caps off the frames of honey. The wax is put in a colander to drain into a pot. I’ll deal with the wax later. 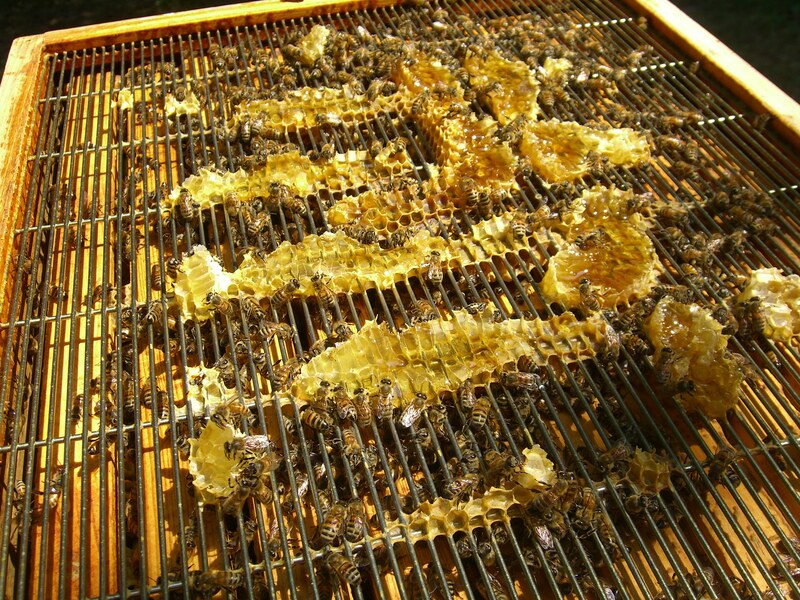 The frames, now oozing honey, are placed into the honey spinner. 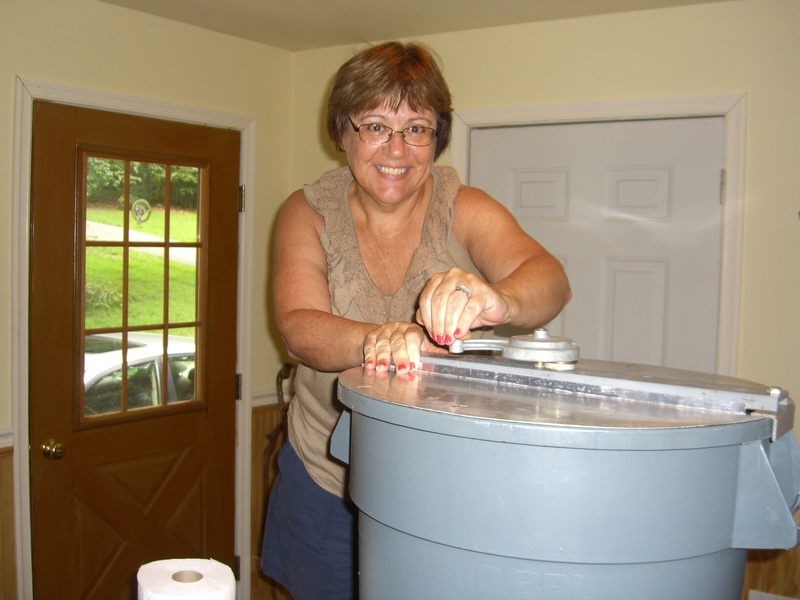 The spinner is a big low-tech centrifuge made out of what looks like a plastic trash can. It works with good ol’ fashioned elbow grease. Round and round I spin the handle while inside the tank the honey spins out of the comb and drips to the bottom of the tank. Let’s just say that it is a good upper arm work-out. There are lovely stainless steel electric models that one could buy for hundreds of dollars, but until the spinning sets me up for another joint replacement or we get a lot more hives, the manual model will suffice. One of our favorite moments in the harvest is when the honey starts pouring from the spinner into the storage bucket below. 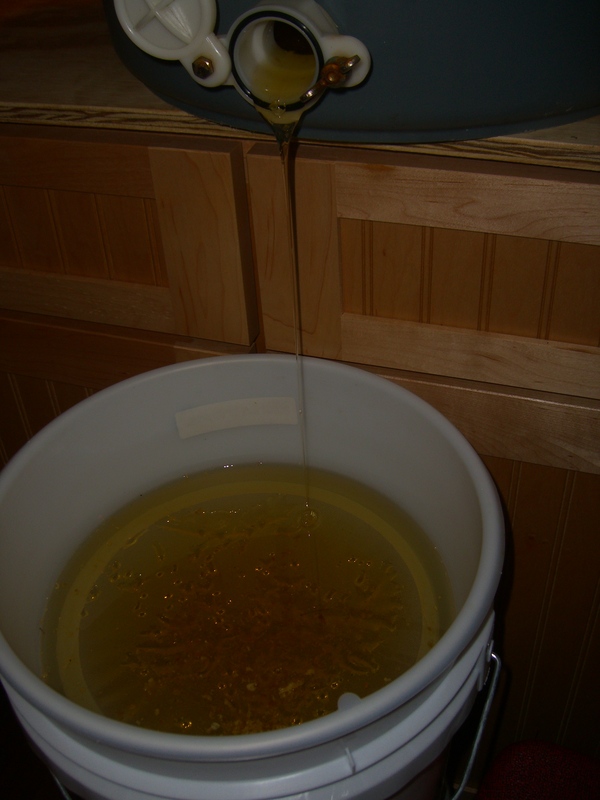 The deep golden sweetness oozes from the spininer, passes through a filter, and fills up the bucket. This year we had to buy a second bucket. All told, we collected about six gallons of honey. Buckets of honey waiting for jars. After a few days, the air bubbles settle out of the honey, my arms recover, and my order of jars arrives. Now it is time to jar the honey. 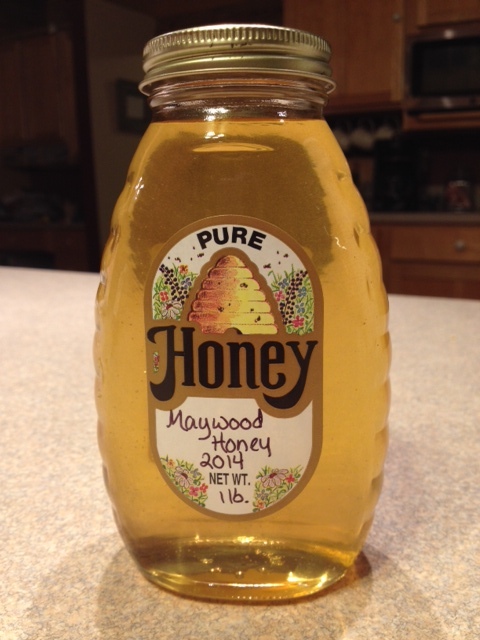 An evening is spent filling the jars, writing “Maywood Honey 2012” on sixty-seven self-adhesive labels, slapping them on the jars, and wiping the stickiness away. 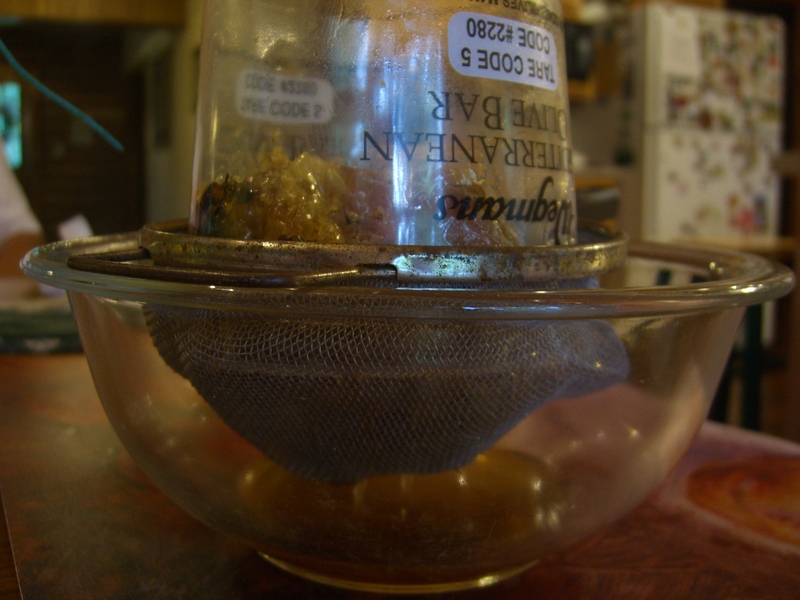 Stickiness, by the way, is everywhere–the jars, the counters, the floor all have a slight film of honey. And bits of propolis, which is what bees use instead of duct tape. Propolis on a counter can’t be wiped; it has to be scraped off. And then you have to figure out how to scrape it off the scraper. Finally, it is all done. The harvest is in. The kitchen island gleems with jars of golden-brown honey. A celebratory bowl of maple walnut ice cream drizzled with our own honey is my reward. 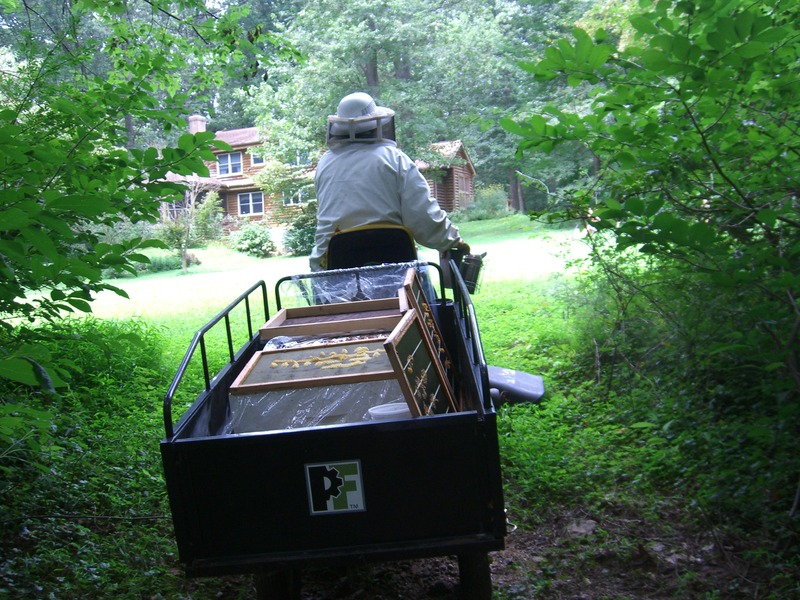 Today was an exciting day as we got the hives ready for harvest. 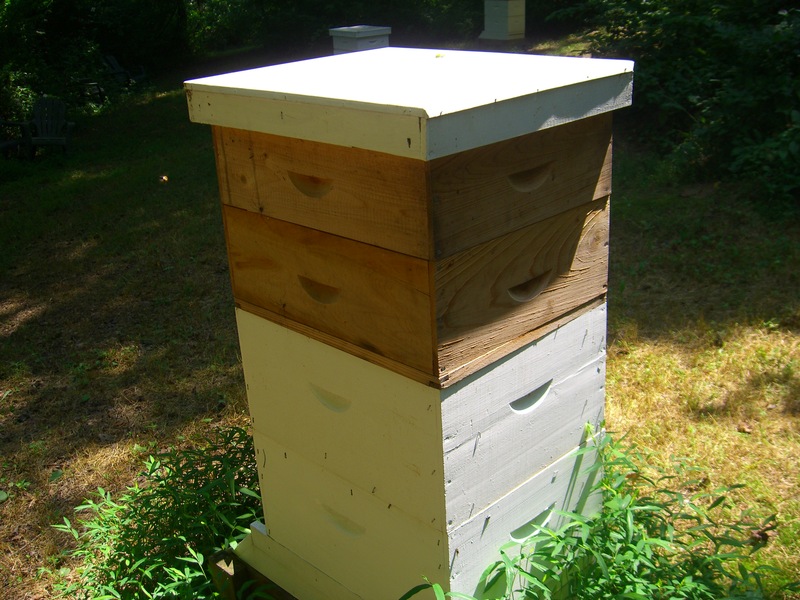 (2) to try to prevent robbing by minimizing the size of the hive opening. We were also able to look in the honey boxes and assess how much honey we will collect. 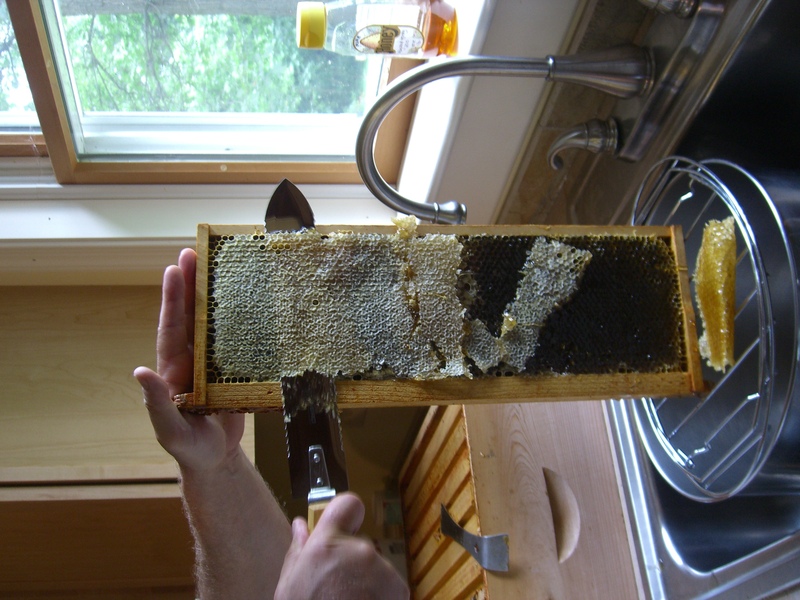 As an added perk, we collected some burr comb and had our first taste of this season’s honey. The plan is to harvest this coming Saturday. I can justifiably say “we” now because I have my own beesuit and can do more than just watch, even though today I mostly just watched. 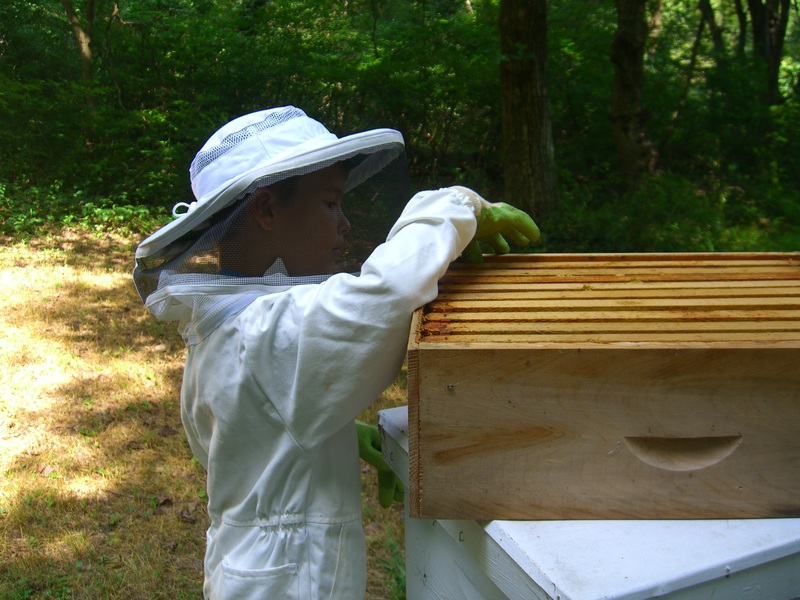 Our junior beekeeper did not suit up today, as he had already changed to go play with friends. He stood in my usual observer’s spot and picked the bark off his walking stick. When you prep the hive for harvest, go prepared to deal with burr comb. We had nothing with us to put it in. John didn’t want to plop it on the ground because the scent of all that honey might instigate robbing. Plus, we wanted to taste the honey. So, I had to run back up to the house to get a container with lid. Meanwhile the hive was open with the scent of honey wafting around the bee yard. He’s smokin’! But he forgot to bring the entrance reducers. Also, if you plan to put entrance reducers on, you should actually bring them with you. This time John ran back to the house while I stood in the bee yard with a plastic container full of beeswax and live bees. As bees made their way to the top, I would shoo them off and away. Many, though, were trapped in layers of dripping wax. I could almost hear them calling to their comrades: ” I’m trapped! Help! Get the jaws of life and get me out of here!” Others, alas, were doomed, drowned at the bottom of the container in a puddle of honey. I was so fascinated watching them that I didn’t even take pictures. It would be a good idea to have extra honey box lids with the bee escapes already attached. John thought the bee escapes would just fit over the exit but they had to be nailed tight. 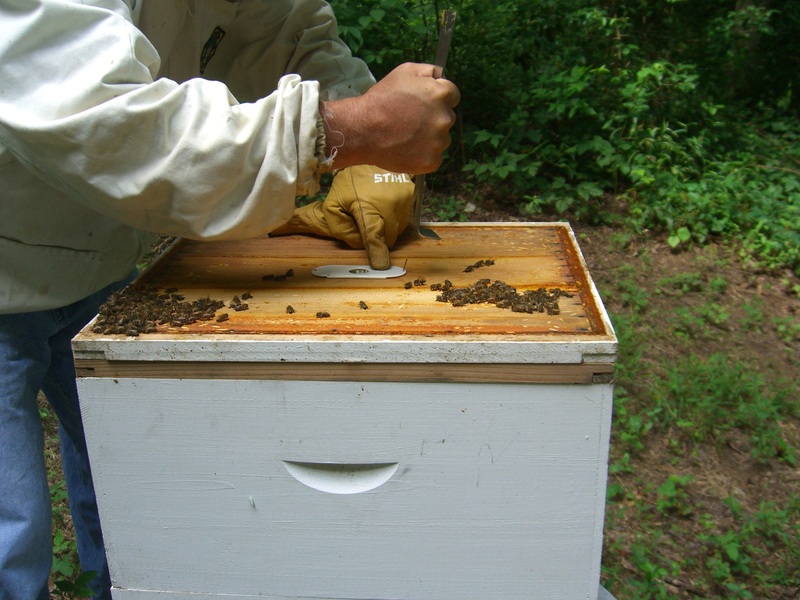 It was awkward trying to hammer a tiny nail with a hive tool while wearing gloves, so John took off a glove to hold the nail while banging on the honey box with his hive tool. I can’t think of a better way to get someone angry with me than banging on their house before stealing their stuff. He did not get stung, though. Bees entering and exiting the honey box. 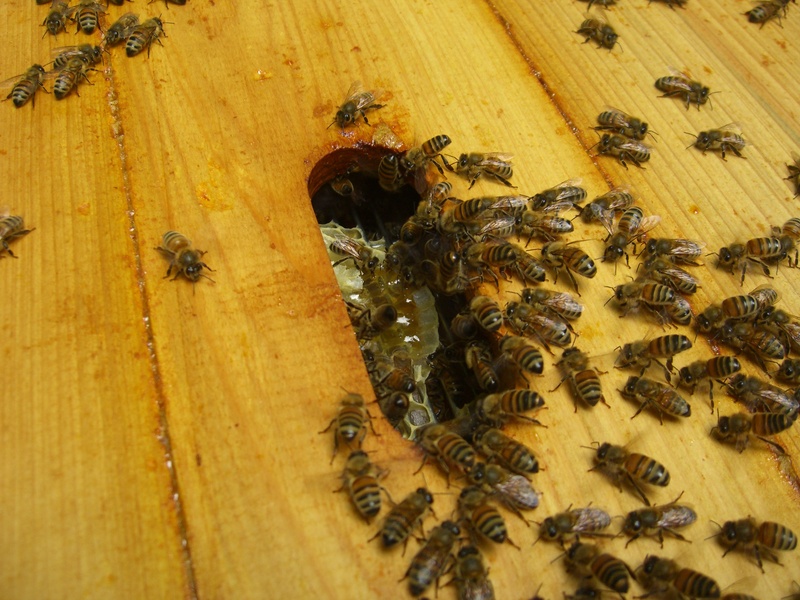 With the bee escape in place, bees can exit the honey box but must re-enter the hive through the front entrance. This should make it easier for us to take the honey–there won’t be so many bees in the honey box. We learned that Hive D is lazy. 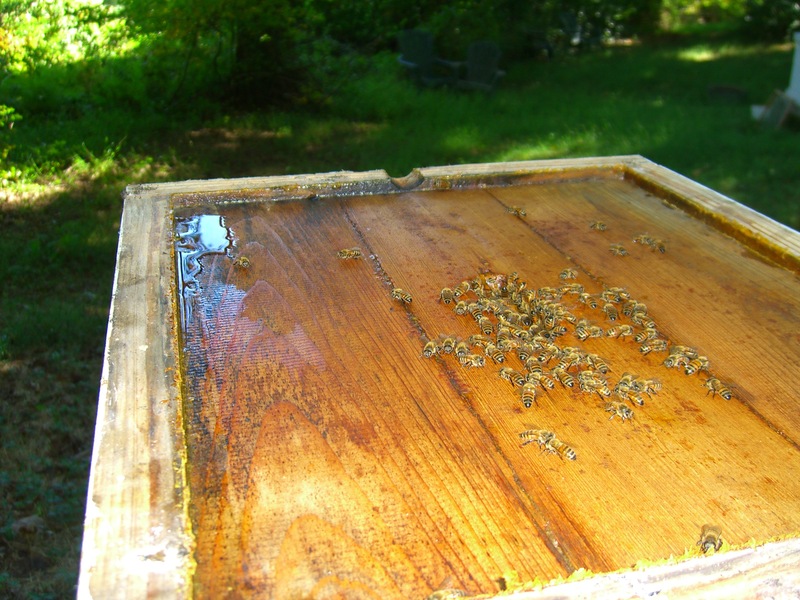 Even with the addition of a honey box to get them moving, the honey box was quite clean. The orange stuff is propolis. Hive A makes the most propolis. 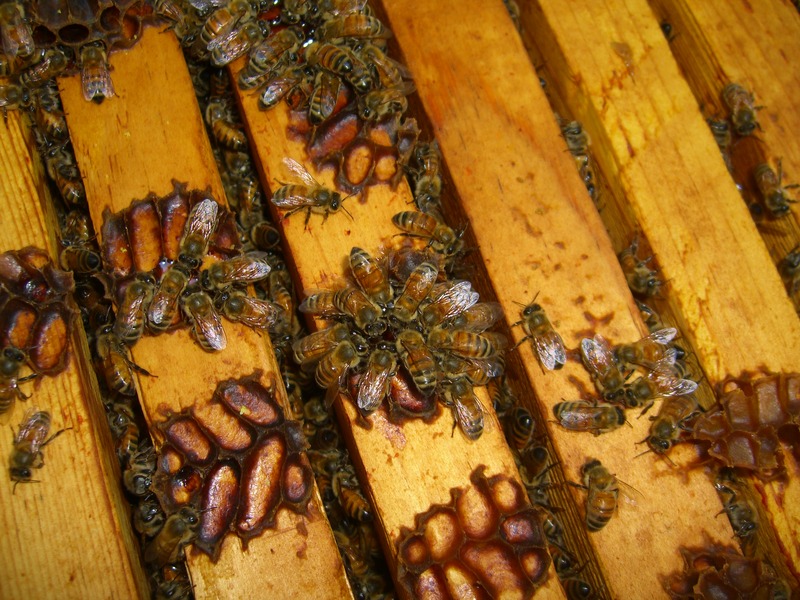 Propolis is like bee caulk. They use it to seal the hive. They did a fine job filling their honey box, after a slow start which necessitated requeening the hive. Hive C did a great job filling their honey. They are a new hive, like Hive D, but they are producing better. Hive B, going gangbusters since the first sign of spring, has filled the better part of two honey boxes. Way to go, Hive B. So, on a positive note, we learned that we have four honey boxes pretty much full of honey. Woo hoo! This looks to be our biggest harvest yet. 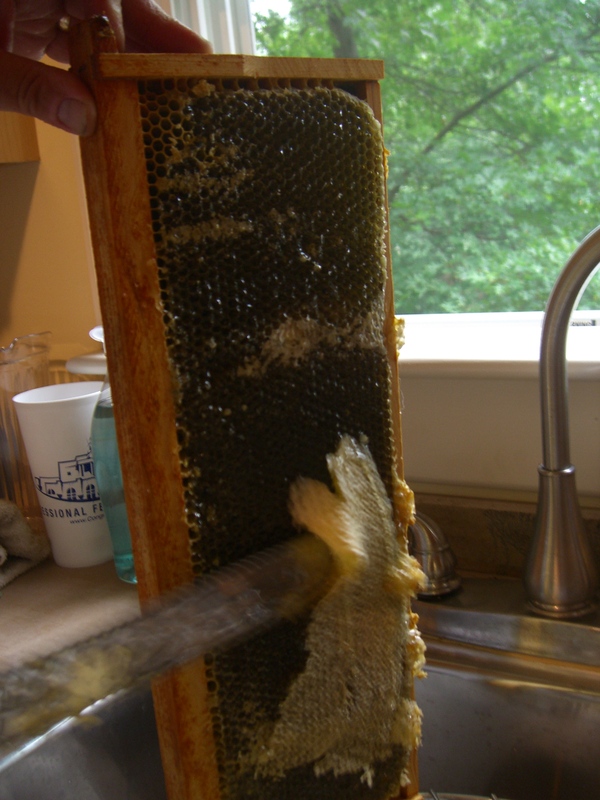 Straining the burr comb for a pre-harvest snack. Yes, the dead bees are in there. That’s why we’re straining it! The honey is a beautiful golden color with hints of tulip poplar and other florals. Not as strong in flavor as our wonderfully pungent first harvest, it has more presence than our last harvest, which was light and delicate. Preview of this year’s honey! Saturday, weather permitting, is harvest day. It’s time to order more jars. We’re having a rough year with the bees. First off, we lost all four hives over the winter. Then, after ordering replacements, three of the queens did not take and John had to order three new queens. Things were off to a slow start this spring. Two theories. One theory is that they swarmed. If they swarmed at the beginning of our vacation, they are long gone. The problem with this theory is that the hive was new and not particularly strong. We were not expecting much, if any, honey from them. They didn’t even have a honey box on the hive. So why would they swarm? They were still in growth mode. And why is the hive completely cleaned out? 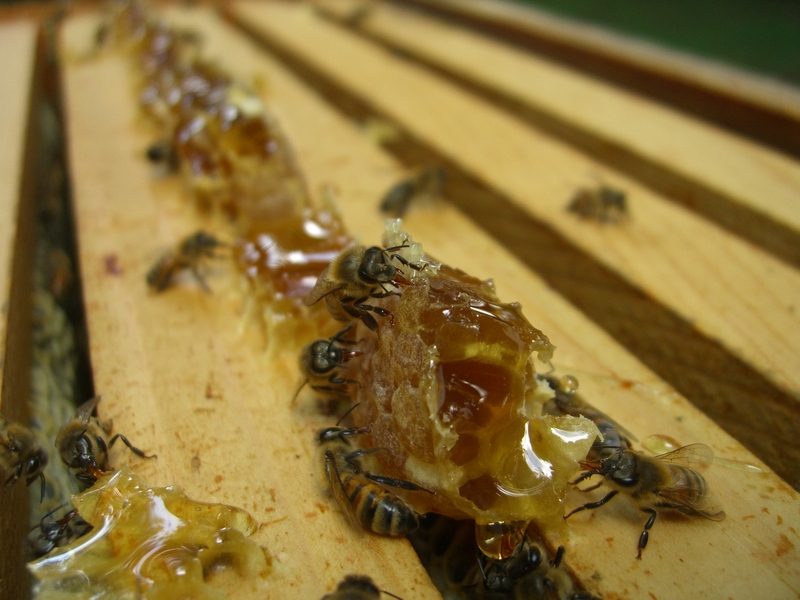 Bees gorge on the honey when they leave; however, a swarm is to add a new colony. Half the old one should be left in the hive to raise a new queen. Theory #2 is that the hive was robbed. If they were weak and other bees wanted their honey, the stronger bees would attack. They would battle to the death and the conquering bees would take the honey as booty. Evidence of a bee-battle would be dead bee carcasses. However, if this happened at the beginning of vacation, ants and other scavenging critters could have cleaned up the mess by now. We first inspected the exterior of the hive. The “front porch” entrance was clean, as John had noticed earlier. We checked on the ground for dead bees. Surely ants couldn’t have carried off every single bee carcass, could they? We found nothing. 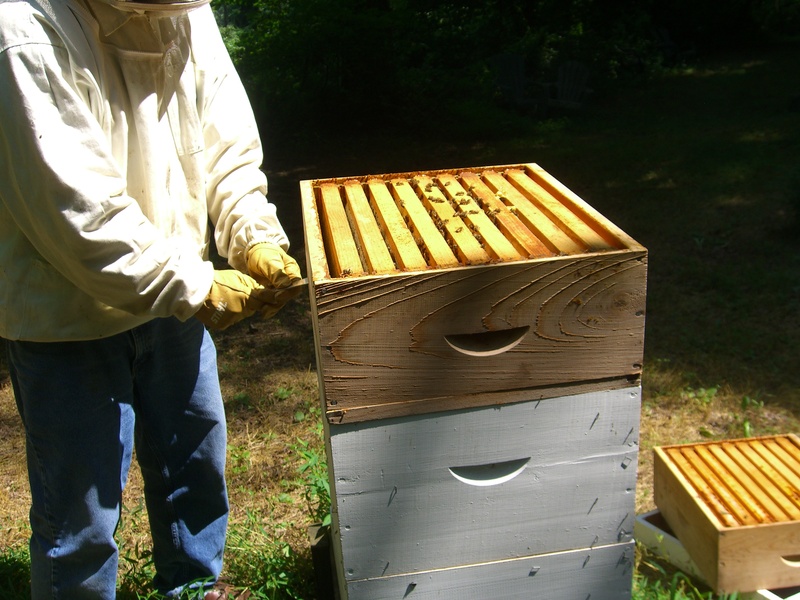 John opened the hive and pulled frames out one by one. Frames were empty of honey. Some wax moths were wandering in there, which John squished with his knife, but otherwise, the hive was ready for new occupants. Alas, we’re down a hive. And only one of the remaining hives has a honey box on it. So, all you honey eaters who fell in love with our honey the last two years and are waiting for this year’s harvest…umm…better lick that last jar clean. Let the honey harvest begin! Sunday afternoon John began harvesting honey. 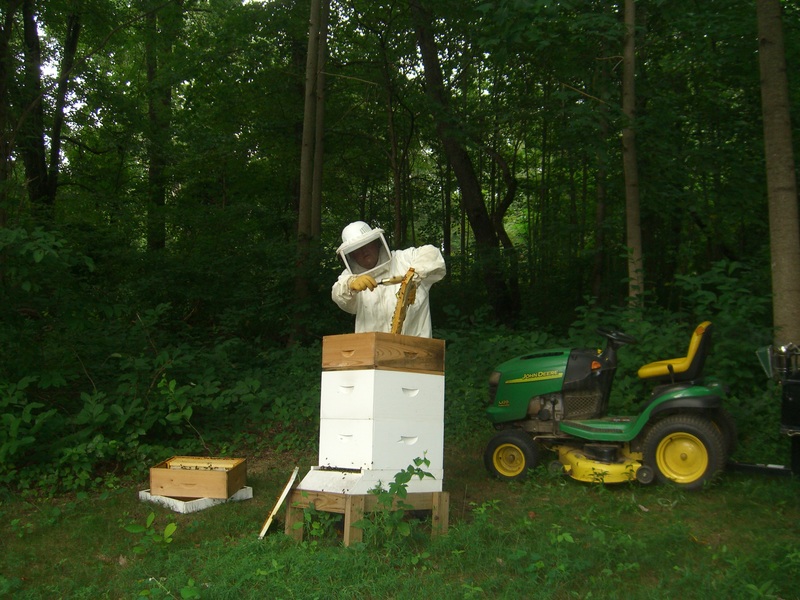 A sudden thunderstorm cut his work short, so he only pulled frames from one hive. The rest will have to wait until next weekend. 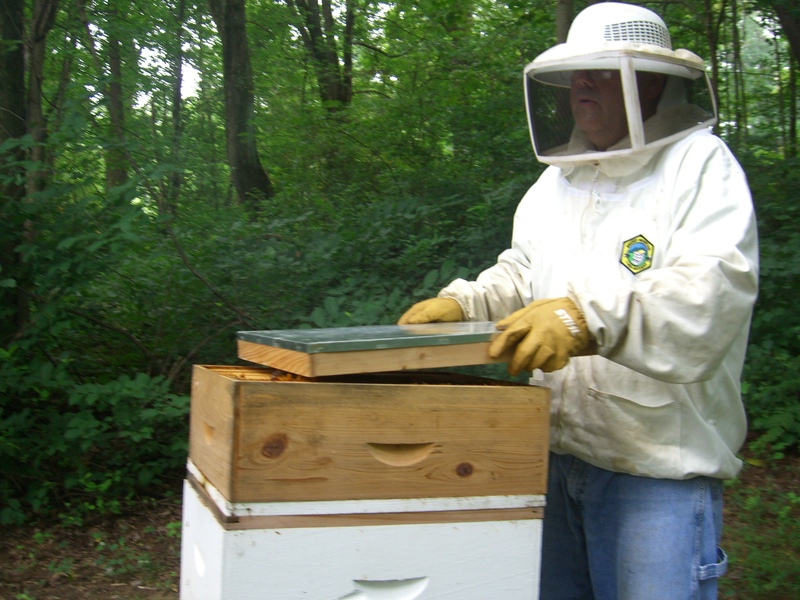 He was able to pull ten frames of honey from that one hive, yielding about four gallons of honey. We’ll know more exactly once we’ve put it into jars. 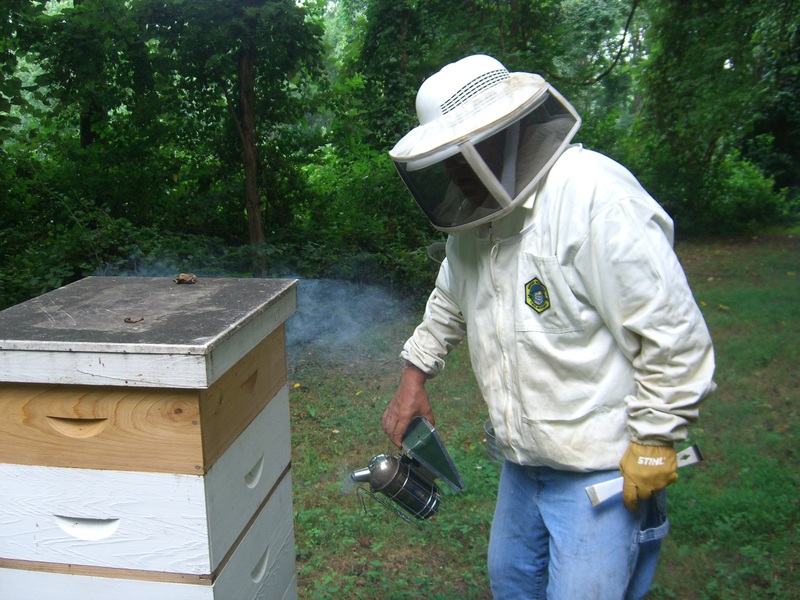 In this picture, John has smoked the hive using smelly stuff to drive the bees deep into the hive to avoid having them attack him. (He’ll correct me on this. I don’t know what the smelly stuff is called, probably “Smelly Stuff.” ) He pulls out each frame to check that the honey has been capped. 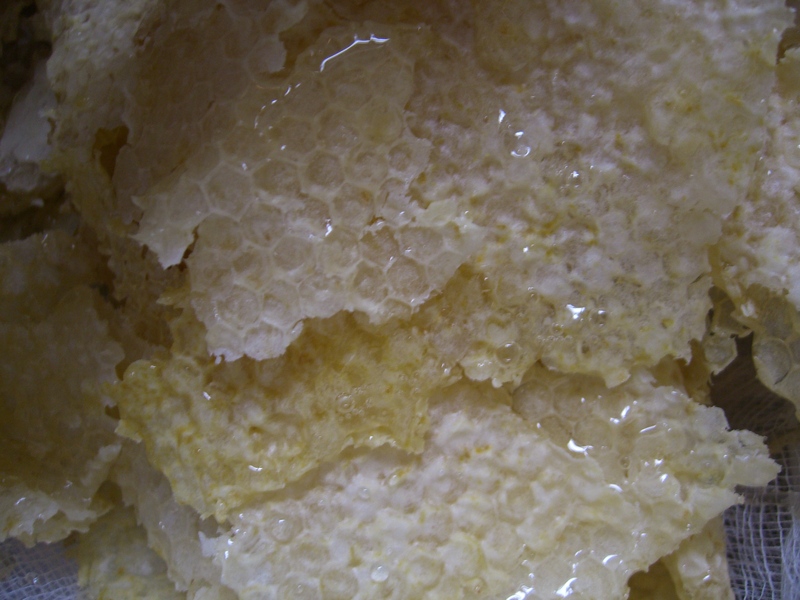 Uncapped honey–nectar– is not yet ready to be harvested. 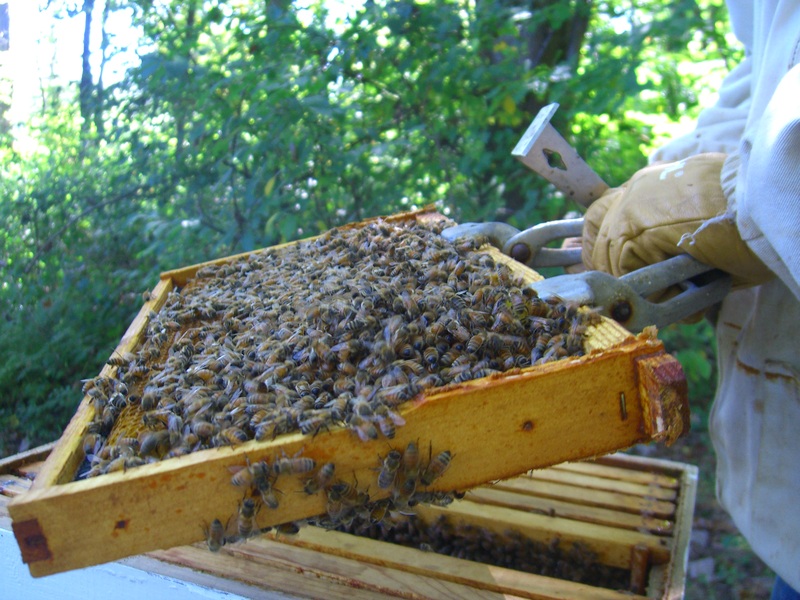 Frames that are fully capped he pulls from the hive and replaces with an empty frame. He uses a soft brush to swish bees off the frame. Experience is such a wonderful teacher. Last year he did not use the smelly stuff effectively or use a brush and we had a horde of bees in the backyard all afternoon. And then this spring we had an appearance of bees in the basement. That was not cool. This year only two bees made it back to the house with him. 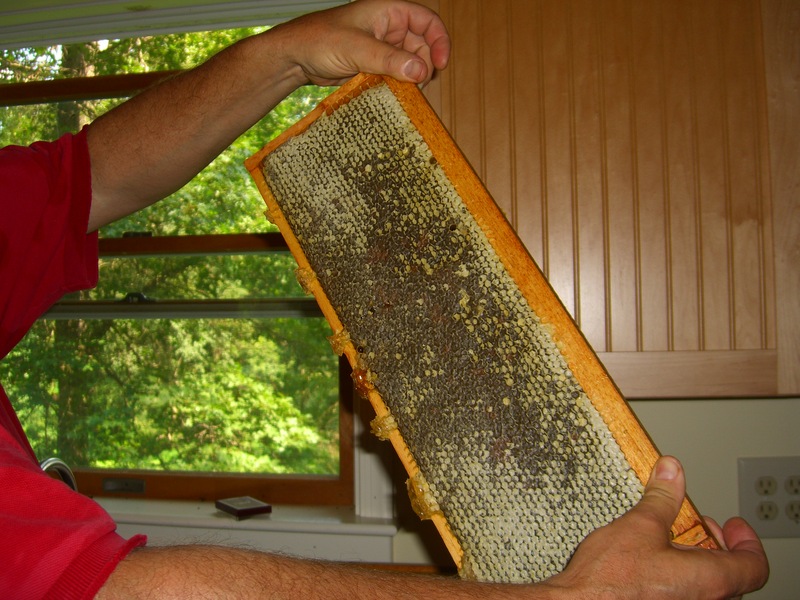 Here John cuts the caps from the frame so that we can access the honey. Frames are placed two at a time in our super-fancy honeyspinner. This super sophisticated device resembles a grey trashcan inside of which is a metal basket attached to a hand crank. I get to work the hand crank (my neck is somewhat cranky as a result). Our little centrifuge spins the honey out of the comb and it collects in the bottom of the trashcan, I mean, honey spinner. The honey in some frames was very light and in others quite dark. The difference in color in these two pictures is not a result of lighting in the room. The honey in these frames really differed this much in color. This has to do with whatever flowers the bees were working on at the time. 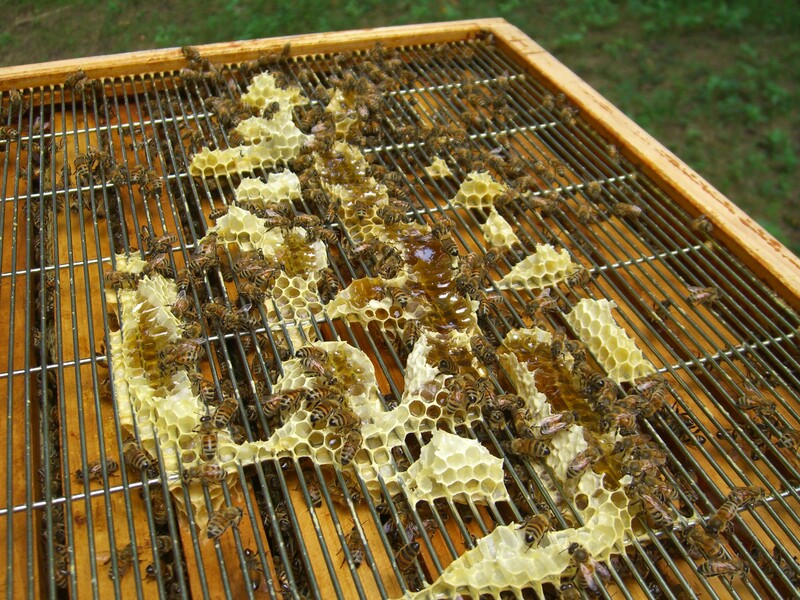 Last year all of the frames had dark honey. This time we spun the various colors together. The result is a lighter honey than we had last year. Last year’s honey had a deep flavor, like molasses almost. This honey smells like wild berries. While we spun the honey, the aroma of wild berries filled the room. Tasting it, we tried to guess which berries. There is a hint of wild grape in there. Hard to say. 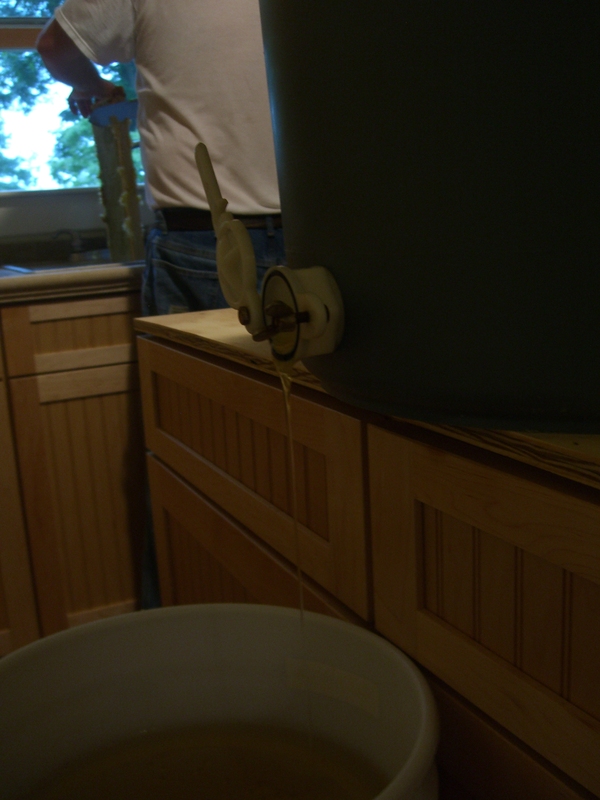 Here the honey is dripping from the spinner into the five-gallon storage bucket. This bucket has a spout on it for easy transfer into honey jars. 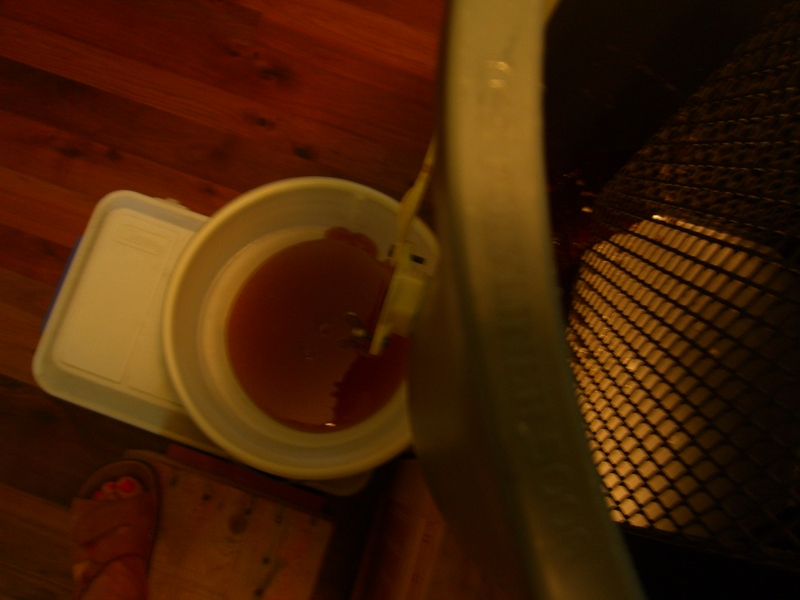 We filled the bucket with about four gallons of honey from the ten frames. 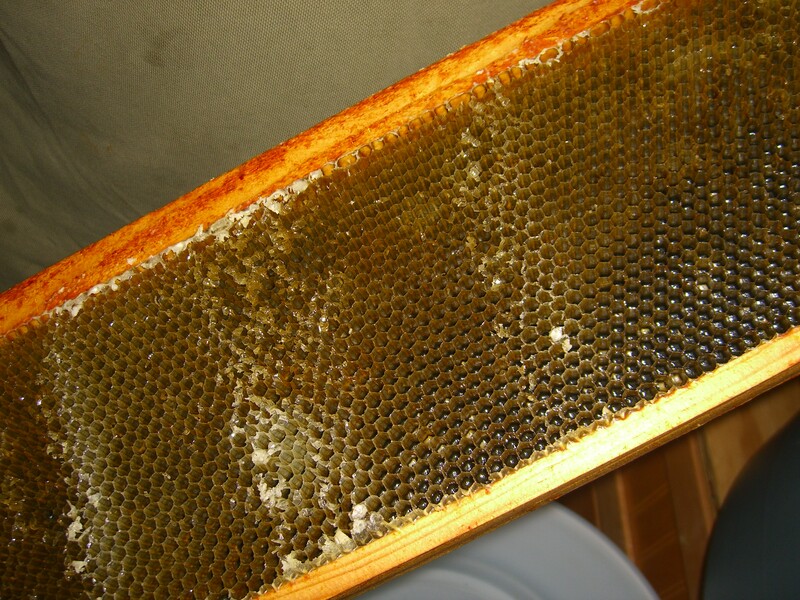 We filter our honey. 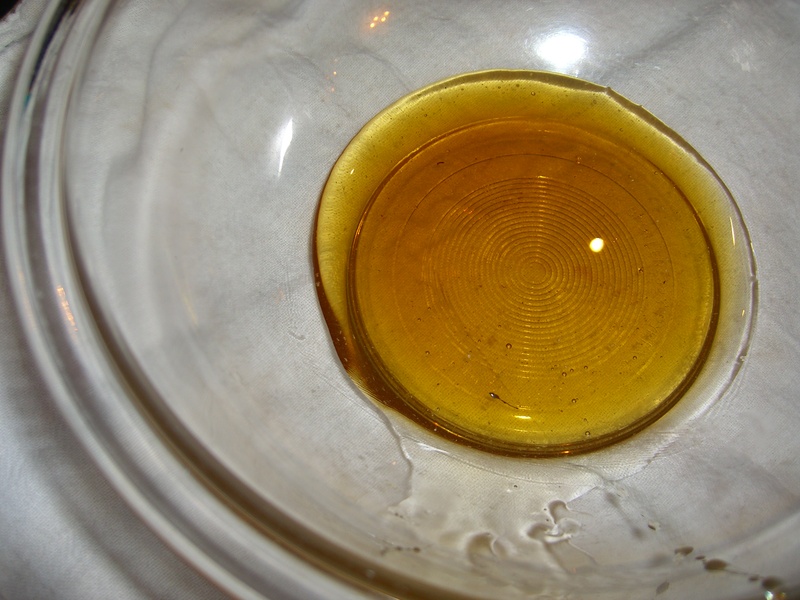 Some people like raw unfiltered honey, with the bit of wax and pollen still in it. But it can also have little bee parts in it, too. I’d just as soon get rid of little bee legs and such. It looks better when I drizzle it on ice cream. The filter sits right on the storage bucket. The four gallons that we spun on Sunday are now sitting for a few days to allow air bubble to rise. We will skim off the bubbles before putting the honey into jars, currently scheduled for Thursday evening. And the cappings? Here they glisten with honey. We let them drain, and then I will purify the wax so I can use it. But that is another story.